Whether it is you kids first year, or their 4th, getting a dorm room organized can be a monumental undertaking. Here are some seriously cool and stylish products to help your student stay organized this school year. 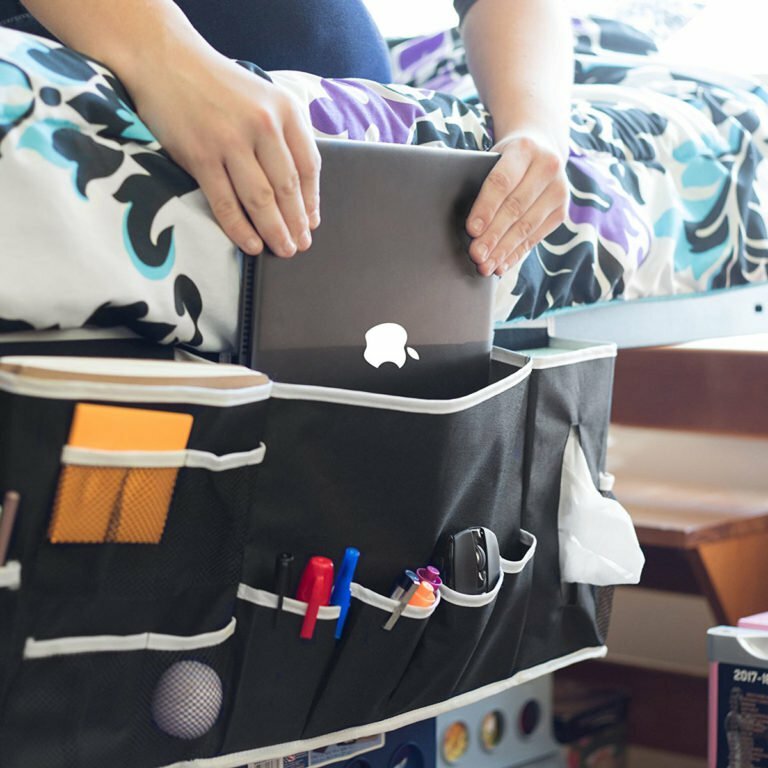 This hanging caddy will help your student keep all their dorm essentials organized and in one spot. Use it to store a laptop, phone, notebooks and books along with pens and highlighters. Accidents will happen so make sure your child is prepared. This first aid kit comes in a soft case and has all the essentials for those cuts, bruises and scrapes. Make sure all your student’s electronics are ready to go with this 6-outlet power strip surge protector. It includes four USB charging ports. There will come a day when your child starts complaining about dorm food. That’s when this 5-Ingredient College Cookbook will come in handy. It offers delicious meals for students on a budget. Your child can keep all their dorm room valuables safe in this portable, under-bed safe. It is easy to move, comes with steel cables to secure it to something permanent and is a great place to store a wallet, passport, laptop or tablet. Dorm room storage space is at a premium so it’s important to make the most of every square inch. These foldable drawer dividers will help your child keep clothing and other items organized and in their proper place. Your child will be able to display their favorite photos and light up their dorm room with this LED string light display. It has 10 photo clips with warm LED lights for a soft glow. Have bunk beds? No problem! This bedside shelf easily attaches to the side of the bed to hold a cell phone, drinks or an alarm clock. This dimmable LED desk lamp will help light up your student’s work space, and it has a handy integrated organizer for pens and other small objects. It also features a USB charging port, temperature read out and a basic clock and calendar. Heck, some of those items are of interest to me!! Forget dorm rooms! Lol. Great ideas! Don’t you love that tray! Such a good idea. I remember years ago my mom had a waterbed. She had something like this attached to her frame. What a great idea! Those are pretty cool ideas that cold even be used at home! I love that power strip and the bed tray! Thank you for checking it out Robin! Love that bed tray…could work for everyone! I love that one too. I would spray paint mine to match my bedroom. I am a university student and these are really handy! Didnt know about the portable safe but looks cool and functional. Thank you Maham. What are you studying? Your blog is very interesting….thank you. Best of luck to you in the future! Thanks a lot! Really appreciate it!